2. Heat the extra virgin olive oil on high in a large nonstick skillet. 3. Add onions and sauté for 4-5 minutes, until they start turning translucent. 4. Add the garlic and sauté another 3 minutes. Remove the onions and garlic from the pan into a bowl. 5. In a separate large mixing bowl, place the brisket and add half of the BBQ mixture. Rub generously. 6. In same pan as the sautéed onion mixture, add 1 Tbsp oil and let the pan get hot. Place the meat in the pan. 7. Braise each side of the meat for 5-6 minutes. 8. The onion-garlic mixture should then be placed in the bowl the meat was mixed in, followed by the beef broth. Mix well. 9. Remove the meat from frying pan and place into a 9" x 13" baking pan. 10. Add the broth mixture and 4 Tbsp of BBQ sauce mixture to the hot skillet, then lower the heat to simmer. Make sure to mix the bits of meat from the bottom of the pan into the broth. 11. Pour broth over the brisket and cover tightly. 12. Cook the brisket for 1.5 hrs. Turn the meat in the baking pan over. Cover tightly and cook an additional 1.5 hrs. 13. Remove from oven and uncover. Let cool for 30 minutes. The meat should pull with a fork or by hand while still warm. 14. 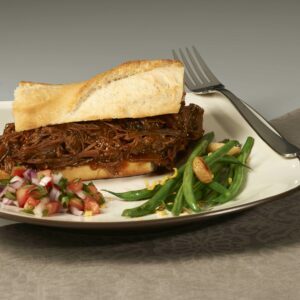 Take the pulled meat and place on slices of the French baguette. Use remaining BBQ sauce for the side. 2. Add bag of green beans and seasonings into a large mixing bowl. Toss well. 3. Place green beans on lined cookie sheet and spray top generously with cooking spray. 4. Cook in oven for 6 minutes. Rotate and cook another 4 minutes. Remove and let cool.